Looking to book Queen with Adam Lambert for a corporate event, private party, fundraiser or public event worldwide? BookingEntertainment.com makes it easy and trouble free to check availability and pricing for booking Queen with Adam Lambert or any other act in the business with absolutely no obligations. Booking Entertainment is the leading entertainment booking agency specializing in booking Queen with Adam Lambert. We will be happy to help you get Queen with Adam Lambert's booking fee, or the price and availability for any other band, comedian or celebrity you may want for your corporate event, birthday party, wedding, fundraiser or public show. At Booking Entertainment, we put our 23 years in business behind you to help you get the best price for any entertainer, comedian or celebrity for your event. In addition, our team of seasoned industry professionals can handle every aspect of the entertainment portion of your event to make sure the entertainment runs flawlessly. If you are wondering how to book Queen with Adam Lambert for your event, you can trust our Queen with Adam Lambert agent to handle it for you. Find out why Fortune 500 companies, high net worth individuals and fundraising organizations come back to Booking Entertainment year after year for their entertainment buying needs. We can literally book any act for you anywhere in the world. The band Queen actually began with a group called Smile, established by Roger Taylor and Brian May in 1967. After losing their lead vocalist, Taylor and May recruited vocalist Freddie Mercury to join the group. They then added John Deacon on bass, and the four musicians spent the next two years rehearsing together while finishing up their college educations. By 1973, they were ready to fully embark on a career in music, and they adopted the name Queen and released their self-titled debut. Queen brought the band moderate success, but Queen II became the band’s breakthrough in the following year. The single “Seven Seas of Rhye” shot to the top of the charts, and Queen embarked on an American tour with Mott the Hoople as an opening act. Queen II quickly climbed into the charts in America also, and Sheer Heart Attack followed before the end of 1974. A Night at the Opera came next in 1975, and the single “Bohemian Rhapsody” became an iconic, enduring hit, breaking records by lingering in the number one spot for nine consecutive weeks in England. In America, both the single and the album reached into the Top Ten and went platinum, and Queen began to ride the waves of success. With lavish, indulgent celebrations becoming a part of their reputation, Queen spent the coming years performing to sell-out crowds and releasing a string of successful albums and singles, including: A Day at the Races, News of the World, Jazz, The Game, Hot Space, "Somebody to Love,” "We Are the Champions"/"We Will Rock You," "Fat Bottomed Girls"/"Bicycle Race," "Crazy Little Thing Called Love, " "Another One Bites the Dust,” and "Under Pressure." The hits carried them well into the 1980’s, at which point Queen’s popularity began to decline. Queen took to touring overseas and tackled foreign markets, establishing a strong fan following in Asia and Africa. A stunning performance at 1985’s Live Aid concert brought them a resurgence in popularity in Europe, however, and Queen released A King of Magic in the latter part of the decade. The Miracle followed in 1989, to moderate success, but Innuendo (1991) went gold and rose to the Top 40 on the charts in America. By this time, however, Queen was faced with troubling and saddening news – front man Freddie Mercury was battling the end-stages of AIDS. A mere day after making the public announcement to the effect on November 23rd, 1991, Freddie Mercury passed away. Queen’s remaining members held a memorial concert in his honor the following spring, featuring a stellar lineup including David Bowie, Annie Lennox, Elton John, and Def Leppard. The event raised millions of dollars for AIDS research. Queens surviving members retreated into solo projects for a while, but in 1994 they reunited to finish recordings for some of Mercury’s last vocal tracks. The result was the album Made in Heaven, released in 1995, and in 1998 following they released Crown Jewels, a box set. Queen would again retreat into the background, until in 2005 the band resurfaced and added Paul Rodgers to their lineup. Queen with Paul Rodgers toured throughout 2005 and 2006, and in 2008 they performed at the 90th birthday celebration for Nelson Mandela in Hyde Park, London. A new studio album, The Cosmos Rocks, went into production and was released that same year, and another tour began in support of the album. Although Paul Rodgers left Queen in 2009, saying that the arrangement had always meant to be a temporary one, Queen has continued to re-release previous albums and compilations, and in 2011 the band used lost demos of Freddie Mercury on vocals to begin work on a new album. Queen performed at the Summer Olympics’ closing ceremonies in 2012, opening with a video clip of Mercury on stage performing at a 1986 concert. Queen continues to delight fans, carrying on the memory of Freddie Mercury whenever possible. For more information on booking Queen with Adam Lambert, please contact Booking Entertainment. One of our top booking agents will be happy to work on your behalf to get you the best possible price to book any big name entertainer for your upcoming public, private or corporate event worldwide. The agents at Booking Entertainment have helped clients book famous entertainers like Queen with Adam Lambert for private parties, corporate events and public shows around the world for over 23 years. Our agents will be happy to assist you with any of your famous entertainment buying needs. All you need to do is fill out an entertainment request form or call our office at (212) 645-0555, and one of our agents will help you get pricing information and available dates for Queen with Adam Lambert or any other A-list entertainer for your next event. How to book Queen with Adam Lambert for a corporate event? Booking Queen with Adam Lambert for corporate events is a great way to thank your employees and clients, and in addition, hiring Queen with Adam Lambert for a corporate event is a fantastic way to promote your company's image to your industry. 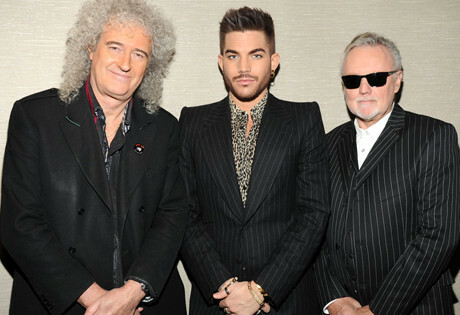 Booking Entertainment can book Queen with Adam Lambert for corporate events worldwide, providing you with the fee to book Queen with Adam Lambert and their availability on your specific date. We have helped our clients book Queen with Adam Lambert and thousands of other acts for almost 25 years. Whether you are looking at hiring Queen with Adam Lambert for a corporate event, product launch, trade show, holiday party or an employee appreciation event, your assigned Booking Entertainment agent will be happy to get you the best price for booking Queen with Adam Lambert and help make sure that every aspect of the entertainment portion of your corporate event is executed flawlessly. How much does it cost to book Queen with Adam Lambert for a corporate event and what do the fees for booking Queen with Adam Lambert include? If you are looking to hire Queen with Adam Lambert for a corporate event and are looking for Queen with Adam Lambert’s booking fee for corporate events, Booking Entertainment will be happy to get you pricing to book Queen with Adam Lambert for your date for free. The cost of hiring Queen with Adam Lambert for your corporate event can include just the price of booking Queen with Adam Lambert for a corporate event, or we can give you an estimate for booking Queen with Adam Lambert that includes absolutely everything that goes into hiring Queen with Adam Lambert including all fees, flights, hotel, ground, production, green room requirements and our veteran production team onsite to make sure everything runs smoothly from load in to load out. How Much Does It Cost To Hire Queen with Adam Lambert? Looking for Queen with Adam Lambert booking cost, fee or pricing? When you are booking an act like Queen with Adam Lambert, many factors determine the final price, including the artist's touring schedule and other shows they may have in your area. Fill out an entertainment request form or call our offices at (212) 645-0555 and one of our booking agents will get you a pricing fee and availability for your date and assist you in booking Queen with Adam Lambert or a different well-known act for your next event. How Do I Hire Queen with Adam Lambert For A Private Party? Wondering how much does it cost to book Queen with Adam Lambert for a private concert or will Queen with Adam Lambert play a private party? Whether you are looking to book Queen with Adam Lambert for a wedding, private party or anniversary party, our Queen with Adam Lambert booking agent who specializes in booking Queen with Adam Lambert will be happy to help you to book Queen with Adam Lambert and take care of everything necessary to make sure the show is executed flawlessly. Fill out an entertainment request form or call our office at (212) 645-0555 and one of our Queen with Adam Lambert booking agents will assist you in hiring Queen with Adam Lambert for a private event anywhere in the world. How do I hire Queen with Adam Lambert for a college concert from booking agencies that book concerts for colleges and universities? Booking talent for college and university events is something Booking Entertainment has been helping college talent buyers do for almost 25 years. Whether you are looking to book Queen with Adam Lambert for a sorority party / fraternity party or a college concert event sponsored by the college entertainment committee, college talent buying is something we specialize in at Booking Entertainment. Simply fill out our form, email us or call the office and one of our college booking agents will be happy to help you make sure that every aspect of booking Queen with Adam Lambert or anyone else for you college event is taken care of to ensure your college or university concert runs smoothly and cost effectively. How much does is it cost to book Queen with Adam Lambert for a college or university concert and are fees for booking college concerts less expensive? When college entertainment buyers book famous entertainers such as Queen with Adam Lambert to play for college concerts, sorority parties or fraternity parties at colleges and universities, we know the acts tend to charge a lower fee than they would cost for a traditional public or private concert. Of course, how expensive it is to book college entertainment depending on how big of an act they are, but colleges and universities tend to get a better fee for booking big name entertainment for college and university events. One of our college entertainment booking agents will work closely with you to make sure you get the best possible price for your college’s concert. Buyers who don't have a lot of experience booking famous acts often find the process frustrating when they try to do it on their own. Our Queen with Adam Lambert agent that specializes in booking Queen with Adam Lambert can use our reputation and relationships to help you navigate the entertainment buying process and get your offer for booking Queen with Adam Lambert seriously considered. The artist’s managers want to know that everything will be handled properly, and Booking Entertainment’s stellar 23-year reputation and our attention to detail provide them with the peace of mind that the show will be flawlessly executed from beginning to end. How Do I Book Queen with Adam Lambert For A Fundraiser or Gala? Wondering how much does it cost to book Queen with Adam Lambert for a fundraiser or will Queen with Adam Lambert play a gala? Your assigned Queen with Adam Lambert agent will be happy to help you to book Queen with Adam Lambert and we can even take care of everything necessary to make sure booking Queen with Adam Lambert is easy and trouble free. Fill out our entertainment request form or call our office at (212) 645-0555 and one of our booking agents for Queen with Adam Lambert will assist you to book Queen with Adam Lambert or any other entertainer or celebrity for your next fundraiser or gala anywhere around the world. How Do I Book Queen with Adam Lambert To Perform At My Wedding? You might ask yourself, “How do I hire Queen with Adam Lambert for a wedding?" We have helped hundreds of clients book acts like Queen with Adam Lambert for weddings and wedding ceremonies worldwide. Your assigned Booking Entertainment agent will not only be happy to assist you in hiring Queen with Adam Lambert to perform at your wedding, we will be onsite to make sure booking Queen with Adam Lambert for your wedding is executed flawlessly. Can I book Queen with Adam Lambert for a wedding and how much does it cost to book Queen with Adam Lambert to sing at a wedding? If you are serious about booking Queen with Adam Lambert for a wedding, Booking Entertainment will gladly get you the Queen with Adam Lambert booking fee and availability for booking Queen with Adam Lambert for your wedding date. The price for booking Queen with Adam Lambert will include all of the fees and additional expenses necessary to hire Queen with Adam Lambert for a wedding including all production costs, flights, hotels, ground and green room requirements. If I hire Queen with Adam Lambert to perform at my wedding, how do I integrate booking Queen with Adam Lambert into my wedding? Hiring celebrity entertainment for a wedding is a great way to surprise the guests or even the bride or groom. When we book big name acts like Queen with Adam Lambert for weddings, we work closely with the wedding planner beforehand to make sure everything involved with the entertainment integrates seamlessly with the flow of the wedding . Our staff of veteran producers will then be onsite at the wedding to make sure when you book Queen with Adam Lambert for your wedding, everything runs smoothy from load in to load out. How do I contact Queen with Adam Lambert’s agent or Queen with Adam Lambert’s manager? Even if you have Queen with Adam Lambert contact information, Queen with Adam Lambert’s management contact info like Queen with Adam Lambert’s manger's email or even Queen with Adam Lambert’s manager's phone number, you still need a company like Booking Entertainment to help coordinate everything that is necessary to book Queen with Adam Lambert to perform for your event. Agents and managers contact us all the time to help people that find the agency contact info or management contact info and contact the agents and mangers directly. Managers and agents trust our agency to handle everything to the industry standard as we have for almost 25 years. How Do I Book A VIP Experience With Queen with Adam Lambert At A Event Or Concert? With Booking Entertainment, booking premium seats and backstage meet & greets with Queen with Adam Lambert is easy and accessible to anyone around the world. Fill out an form or call our office at (212) 645-0555 and one of our agents will assist you to get pricing and availability to have Queen with Adam Lambert VIP experience at a concert or event. Booking Entertainment works to get the best possible Queen with Adam Lambert booking fee and Queen with Adam Lambert price for our clients while also providing the celebrity or famous entertainer with the level of professionalism and industry norms that they expect from an event run by a professional booking agency and production management. Booking Entertainment uses our agency / management relationships and over 23 years of production experience to help buyers of headline / top name entertainers and does not claim or represent itself as the exclusive Queen with Adam Lambert agent, manager or management company for any of the artists on our site. Booking Entertainment does not claim or represent itself as the exclusive booking agency, business manager, publicist, speakers bureau or management for Queen with Adam Lambert or any artists or celebrities on this website.